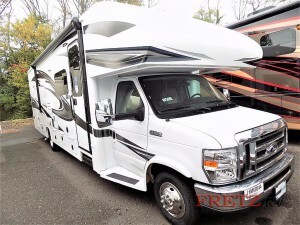 A class C with some real style, the Jayco Greyhawk class C motorhome for sale at Fretz RV is the RV that the whole family can get behind. 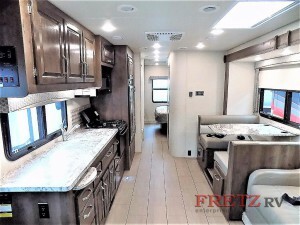 A beautiful model with a lot of features to offer, the Greyhawk class C is more than just an RV, it is a home on wheels that you will never want to leave. This Jayco Motorhome really is built for the family and we’ve compiled a list of some of our favorite features that go along with the Greyhawk class C that make it the ideal RV for families both large and small. Check out one of our outstanding Jayco Greyhawk Class C motorhome models. You absolutely need somewhere for everyone to lay down at the end of the day when you are going RVing with the family. You don’t want to get to your destination and feel cramped or have someone sleep on the ground. The Greyhawk eliminates this problem by providing up to seven sleeping space, including the queen-sized bed in the master bedroom. This means that everyone in the family will have their own dedicated space to relax. You can’t live on hotdogs over the fire every night, especially if you have picky eaters in the family. The Jayco Greyhawk class C makes it to where you can cook any gourmet meal that you have become accustomed to at home by providing you with a large kitchen with residential appliances and more than enough counter space, including a hidden panel, double-door fridge, three to four-burner range, and counter covers for the sink. The Jayco Greyhawk Class C Interior is both spacious and versatile. You won’t always be in walking distance of a bathroom, and with the Greyhawk, you won’t need to be. The bathroom that comes complete in the Greyhawk is extremely spacious and features a wide standing shower, linen closet, vanity, and sink as well as a toilet, all in an optimized and spacious layout. There are many other features that you will love with these Jayco Greyhawk, many of which will really make the most out of your family RV trips, so make sure that you check out more about our Jayco Greyhawk floorplans for sale and be certain to contact us with any questions.